British Columbia’s under-19 men’s provincial team departed for St. John’s, Newfoundland this morning ahead of the 2014 U19 Canadian Rugby Championship. BC will be looking for a rare three-peat when they face 2013 runner-ups Prairie Wolf Pack, hosts Atlantic Rock, Ontario Junior Blues, and Eastern Ontario and Quebec Voyageurs. 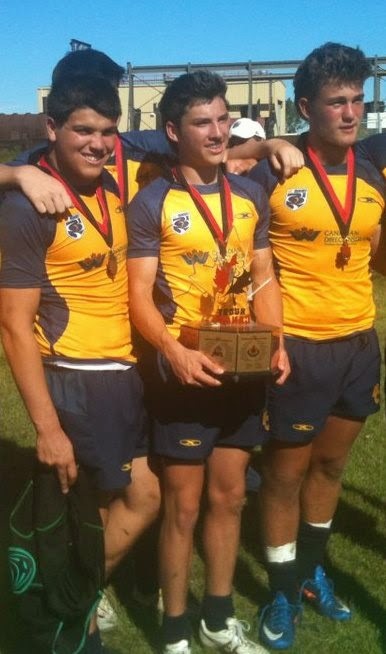 The U19 CRC is the premier 15-a-side youth rugby competition in Canada, featuring players eligible for Rugby Canada’s under-20 entry at the annual Junior World Rugby Trophy. The tournament also serves as a feeder to the senior men’s Canadian Rugby Championship, featuring the highest level of domestic players. The 2013 final saw BC lift the national title in dramatic fashion at Calgary Rugby Park, reversing a 13-10 deficit in the final minutes of play when Vancouver’s James Pitblado went over for a go-ahead try. Arizona State University once again is featuring in international waters. ASU star Full back/wing Connor McRae has got the call up and will be playing for British Columbia to secure their 3 peat. ASU has recently been linked to international successes for their Rugby Athletes. The ASU program is strong and continues to produce world class athletes.